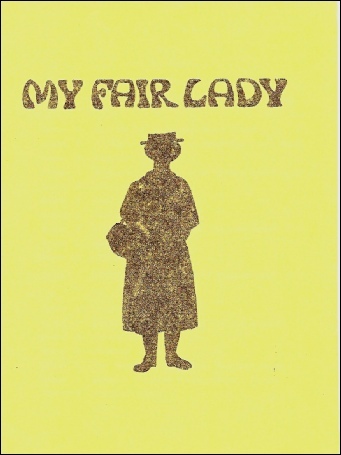 The College production of My Fair Lady was performed on the evenings of Tuesday 6 December, Thursday 8 December, and Friday 9 December 1977 at 7.30pm. There was a matinee performance on Wednesday 7 December at 2.30pm. The sets were designed by students taking the Certificate of Extended Education (CEE) course in Theatre Design. Two groups of 10 students drew the designs, made models, built and painted the sets, and made the costumes. The complex sets for the numerous scene changes presented many problems, not least the limitations of the college stage. Mike Rayner was head of the CEE design course and the sets were built in the design and technology workshop. Anne Weeks was also closely involved in the designs. Costumes were also designed by students on the CEE course. Pauline Barraclough, Head of Needlework, worked on the designs which were made in the Needlework Department. 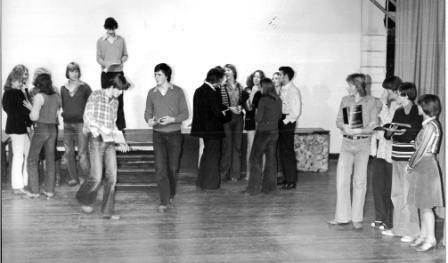 John Hopkins was highlighted by the Farnham Herald as "the only male student taking an "A" level course in dressmaking". Elizabeth Firebrace, who took over responsibility for the college wardrobe, was also involved. Music was directed by Christopher Hand, taking up considerable out of college hours for singers and the orchestra. Casting was the responsibility of the head of production, Jane Walters. 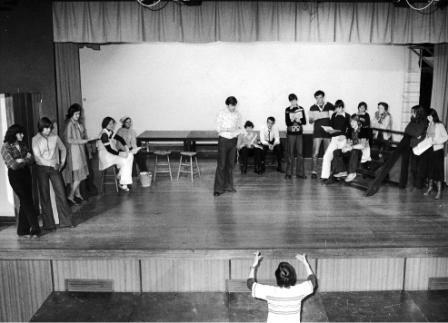 Rehearsals started at the end of September 1977, occupying three rehearsal nights a week. Alison Warren headed the cast as Eliza, having made quite an impression with her solo in "Oh What a Lovely War! 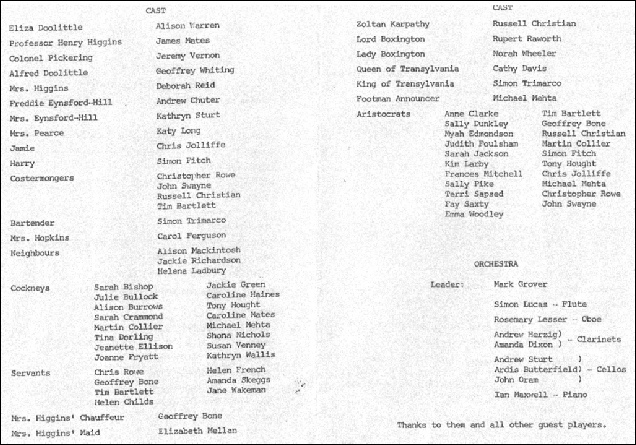 ", Jane Walters' first college production. 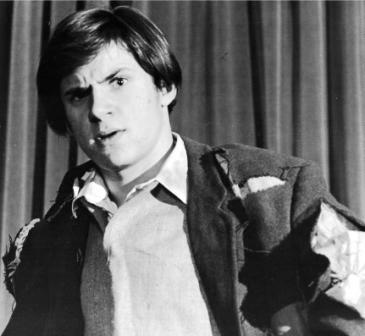 James Mates, "a newcomer to the college", had the demanding role of Professor Higgins. Geoff Whiting had the "plucky part" of Dolittle. 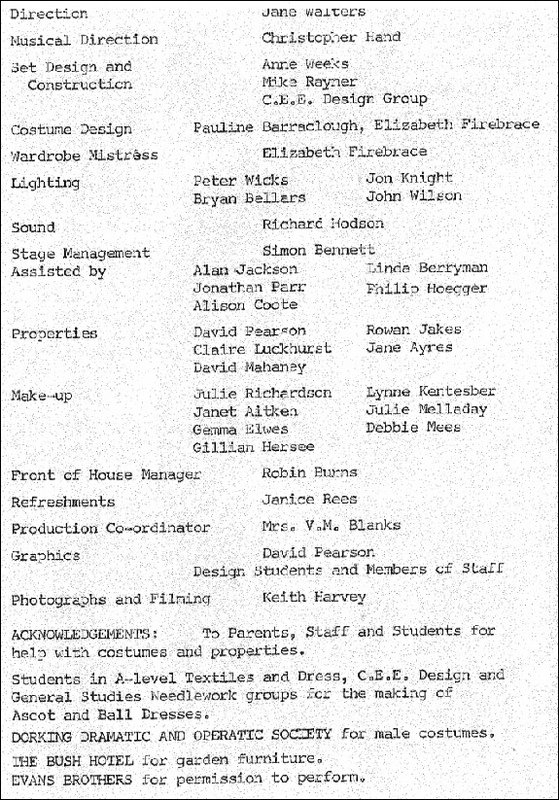 Other cast members included Andrew Chuter (Freddie), Deborah Reid (Mrs Higgins) and Katy Long (the Professor's housekeeper). Others involved in the production were Dave Pearson (posters & publicity), Peter Wicks (lighting), Robin Burns (front of house manager) and Simon Bennett (stage manager). 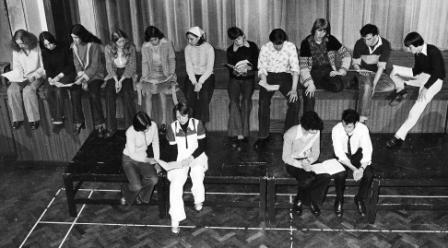 (Above) One of the rehearsals showing Jane Walters (apparently with fag in left hand!) directing Geoff Whiting and some of the cast in the College Hall. 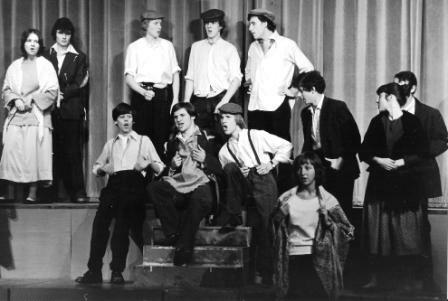 In its review of the play published on 16 December 1977 the Farnham Herald declared it "a stunning production". It went on to praise the performances in the following words, "the magic worked, the spell was cast, and a production which had pace and style and musical proficiency took everyone not only by surprise but by storm". 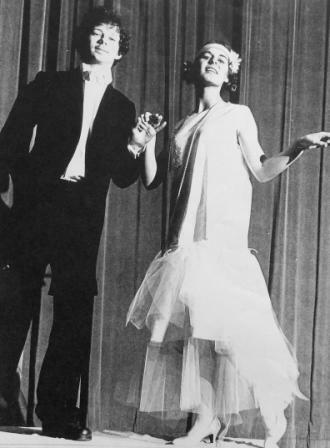 (Left) Geoff Whiting as Alfred Doolittle. The Farnham Herald described his performance as, “a triumph ... acting larger than life in his rumbustious rendering of "With a little bit of luck" with an encore demanded by the audience. ... Gravel-voiced and red-nosed, he looked and sounded the part to its last beery breath." Other members of the cast included Jeremy Vernon (Col. Pickering), Kathryn Sturt (Mrs Eynsford-Hill), Chris Jolliffe (Jamie), Simon Fitch (Harry), Carol Ferguson (Mrs. Hopkins), Norah Wheeler (Lady Boxington), Cathy Davis (Queen of Transylvania), Simon Trimarco (King of Transylvania and bartender) Geoffrey Bone (chauffeur), Elizabeth Mellan (maid) and Michael Mehta (footman). Among the Costermongers were Christopher Rowe, John Swayne, Russell Christian and Tim Bartlett. Neighbours were played by Alison Mackintosh, Jackie Richardson and Helena Ladbury. 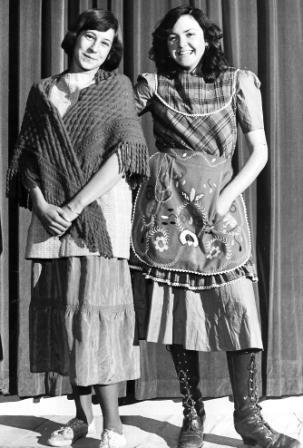 Among the cast of "cockneys" were Jackie Green and Caroline Mates, seen here suitably attired. 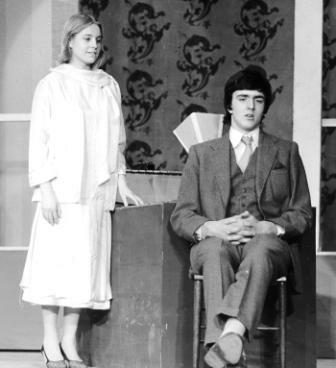 Whilst among the cast of "aristos" were Mike Mehta and Kim Larby, seen here in their posh garb.